College journalists from across the U.S. will learn leadership, management, content development and new media production skills at the Henry W. Grady College of Journalism and Mass Communication on Sunday, July 28 through Friday, Aug. 2, 2019, at the 24th annual Management Seminar for College News Editors (MSCNE).‬ Registration is now open and will be capped at 45 participants. Sponsored by the Cox Institute for Journalism Innovation, Management and Leadership, the seminar will be led by educators and industry professionals. The late Conrad Fink started the program in 1996 to better prepare campus news editors for top management positions at their news organizations. Apply online via the Adviser Registration form link to reserve a spot. While the 2019 agenda is not yet complete, please view the schedule for MSCNE 18 for reference. Read bios for last year’s speakers here. 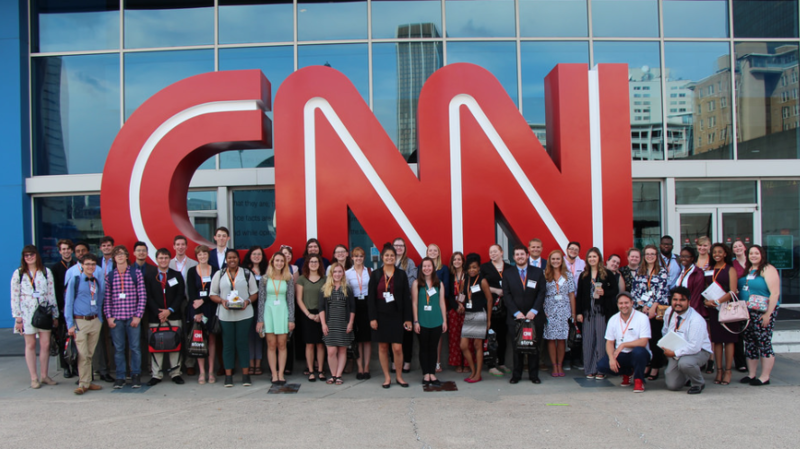 MSCNE 18 participants visit CNN. 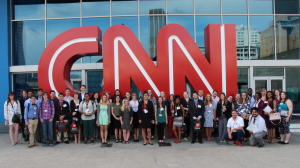 MSCNE participants will also travel to Atlanta and meet with reporters, editors and producers. Student editors will gain hands-on multimedia experience and participate in a simulated news event that involves UGA public safety and communications officials. Please contact Stephanie Moreno, s.moreno@uga.edu, 706-542-5022, with any questions. MSCNE19 will focus on developing editors’ leadership skills and exploring ways that new technologies and interactive journalism are expanding their roles and responsibilities. For detailed information, please follow the link.